Corporate Events. Team Building. On-Site Events. These are a few of the wonderful groups that joined us in 2016, 2017 & 2018. "Because I have given much, I too must give." Pallets with a Purpose is the perfect way to raise funds for your school/ non-profit/ organization! We donate 25% of ticket sales directly back to you. You get to raise money for a cause that you're passionate about, while spending time with others that feel the same! Ticket prices are $50-$65 depending on the project that is chosen by the guest. Each person registers themselves and chooses what they want to MAKE. Everybody gets to make their OWN project! This is just like a private party where YOU will invite YOUR guests and they will register themselves. All "Pallets with a Purpose" Workshops are held on Wednesdays. You MUST have a minimum of 12 guests for your event, the maximum is 40. If you do not meet the minimum, your party will be cancelled, and guests will be issued credits to come in at a later date. It will also forfeit the donation amount. PLEASE make sure you have a committed group of at least 12 before securing a date. We want to help as many organizations as we can! Food & Drinks: You may bring in your own food/ drinks to your event. Alcohol is permitted with a banquet license, but your party guests must all be 21+. Please feel free to email us with any questions or to schedule your party! 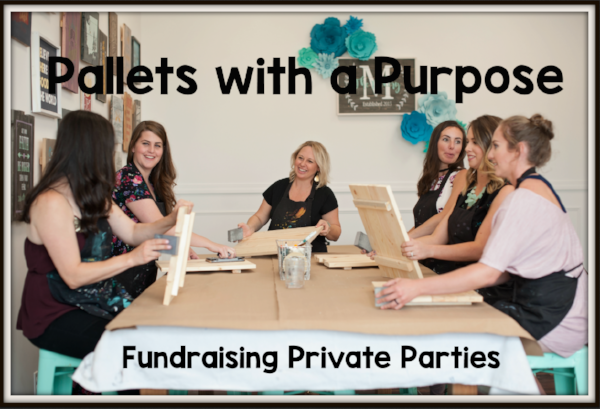 We're looking forward to helping you have a successful fundraising event!